Please read the following carefully. All policies are strictly enforced and it is your responsibility to become familiar with all Sundog Vacation Rental policies and procedures. It is also your responsibility to verify dates and all other information upon confirmation. If you are arriving after hours, it is your responsibility to notify Sundog Vacation Rentals so that we may provide you with the proper resources to access your rental. 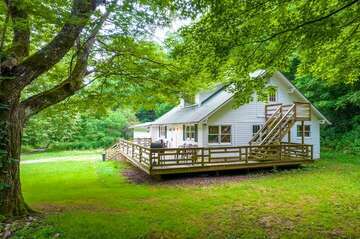 Check-out is promptly at 11:00 a.m.
Sundog Vacation Rentals Welcome Center is located at 83 Brendle Street Sylva, NC, 28779. We will provide you with cabin keys and directions, refreshments, restroom facilities, and arrival/departure information. Please do not rely on GPS navigation, as it is not always reliable in this area. Please contact a reservationist to assist with directions if you have any questions. If you are arriving after the posted hours of Check-in you will be given late check-in procedures.We are not responsible for guests that do not inform us of late check-in needs. Refunds will not be given for failure to notify a reservationist of late check-in and you are unable to get into your cabin. Collect all used towels and place them in the bathroom. Place any used dishes in dishwasher and start before leaving. Please leave keys on kitchen counter in your cabin or in the drop box at the front door of the welcome center. All trash is to be bagged and placed in the proper receptacle prior to checkout. Please do not leave loose trash in the trash receptacle. Never leave trash outside. It will attract wildlife. A $50.00 fee will be added to your final balance if SUNDOG has to bag and remove your trash. Sundog Vacation Rentals is not responsible for any lost or left behind items. If you do leave something behind please let us know and we will do our best to locate that item for you. Renters are responsible for the shipping costs of returning that item. We strive to comply with all reservation requests for specific vacation properties. However, due to ownership changes, properties being removed from rental use, mechanical problems, or other unforeseen circumstances, we cannot absolutely guarantee a specific property. We reserve the right to change property unit assignment without liability should rental property become unavailable. Where comparable properties are not available, guests will have the option of selecting from available properties at the published rate or receiving a complete refund. Cellular reception varies in the mountains but all cabins are equipped with TV/internet as well as local phone service with few exceptions – please speak with your reservationist on cabin particulars. Bathroom supplies are provided for a weekend stay. If your reservation is for more than 2 nights, you’ll need to bring extra. The home also comes supplied with sheets and terry however we do not provide pool towels and prefer that the linens stay in the cabin. Coffee is not provided; bring all grocery supplies to ensure your comfort. Sundog does not provide propane or charcoal for grills. They belong to the homeowners and can be refilled or swapped out at the closest gas station. Club fees apply for Bear Lake Reserve properties. The rate is variable depending on the duration of your stay and the number of bedrooms in your cabin. Please read the rental agreement when you receive it. You may “Streamsign” the document electronically, OR print, sign, scan, and email the agreement to your reservationist. Refunds are only given if canceled more than 2 weeks prior to the arrival date. Compensation is not given for late check-ins, early check-outs, acts of God, Mother Nature, acts of war, acts of government agencies, road maintenance, gas shortages or any maintenance issues that may arise during your stay regarding TV/internet/phone service or the facilities of the property. Sundog is not responsible for any outages however we will do our best to resolve any issues within our means during your stay. If you have maintenance issues during your stay please notify a Sundog employee immediately so that we can contact appropriate parties for repair. Delay may occur, as most service providers are remote to our location. If an issue cannot be resolved in a reasonable timeframe, and parties are distressed due to age or illness, we may move your party to another available cabin if possible. We rent to responsible adults over the age of 21 only. All guests under the age of 21 must be accompanied by a parent or legal guardian for the duration of the stay. All cabins are non-smoking; if evidence of abuse is found; a $250 fine plus the cost of any damages will apply. If there are damages to a unit during your stay you must report it immediately. As the guest, you will be held accountable for said damages. No house parties. The occupancy of the unit will not exceed the maximum occupancy listed for each cabin. Noise levels must not disturb the community. Failure to preserve the integrity, structure and all contents of your rental property will result in a fine no less than $50 (fines up to $500 in addition to the cost of repair or replacement may be applied). We sincerely thank you for choosing Sundog Vacation Rentals, and hope you enjoy your time in the mountains of western North Carolina.